Chains.cc is an online motivational tool based on the "don't break the chain" method that helps you build good habits and break bad ones. Each day you complete a task you want to keep up, a visual streak grows. The streak will grow longer with each day and soon your main motivation is to keep the chain from breaking. You can choose from several fun skins to match your activity and join groups to find motivation from other users. 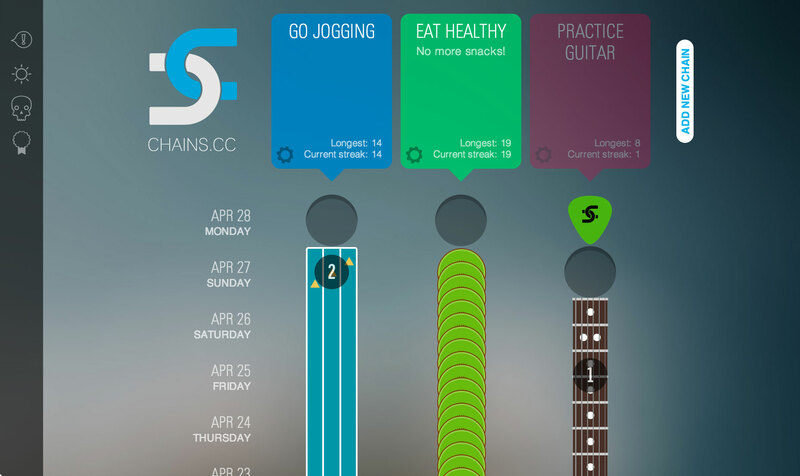 Chains.cc online service is completely free to use and there's also an iPhone app available in the App Store to help you stick to your habits wherever you are. Whether you're using the seinfeild method, the Zen-Habits approach, or the Mini Habits technique, this is THE best app for building habits. I've been using the Chains.cc website for years and this app has really helped me to form good habits. Knowing that your chain can be broken by just one day of negligence really keeps you on your toes and motivates you to do whatever it is you do.